State Bank of India from this year onwards has decided to recruit probationary officers through taking preliminary and mains written examination. 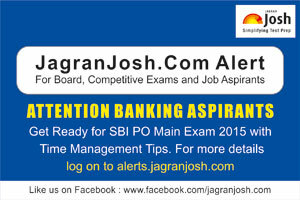 State Bank of India from this year onwards has decided to recruit probationary officers through taking preliminary and mains written examination. The main examination comes after clearing the preliminary examination by the candidates. The main examination more or less contains the same subjects as that off the prelims but the level of questions differ from it. The candidates thus need to prepare quite well for the main examination giving sheen to the preparations further that they have done for the prelims examination. Time management becomes a major factor in the mains examination for the candidates and they need to divide their time equally for preparing for each of the subjects. The paper includes Reasoning (High Level), Data Interpretation Analysis, General Awareness, Marketing Computers and English Language. Each of the papers includes 50 questions and correspondingly 50 marks with it. Candidates get 2 hours’ time to solve the paper and need to be quite fast and reactive to questions. Managing time for Reasoning (High Level) paper: It is very important to understand that the paper we are dealing here needs most of the candidate’s attention as the paper is quite a tricky one to solve. It is thus needed to work hard on the paper keeping the time factor in mind for the candidates. High level reasoning requires attention of the candidates and time becomes a major factor. Thus the candidates need to device methods and tricks while solving the questions in their practice sessions. They need to derive ways to solve questions other than the usual ones used over and over again. Data interpretation and Analysis: As the name of the paper suggests the paper needs ‘analysis ’in part of the candidates. Any sort of analysis takes an ample amount of time in part of the candidates and thus it needs to get managed very cleverly. There are questions related to pie charts, graphs, probability series etc. that needs a certain application of formulas to get solved. The candidates need to have a clear idea of those and must be confident enough while applying it to the questions. It is advised not to apply guess work in the paper as it could turn out to be fatal. On the contrary it is wise enough to move to other known questions rather getting stuck to any specific question for long. General Awareness, Marketing, Computers: The paper consists of questions related to three different branches altogether and thus it becomes a challenging one to solve at times. The paper contains 50 questions in total which belong to completely different subjects and thus needs a shift in the attention of the candidates as well. This paper would be the best one to save your time as there involves no such calculations or applying formulas into any of the questions. All you need to do is to undergo practice sets, take mock tests and undergo information in the specific subjects through various available sources to make sure that you score well in the paper without any difficulties or hurdles. English Language: It is one such paper that can place you in a better position to further get selected in the recruitment process. This paper demands your skills in Basic English language and grammar. If you could attain proficiency over the two half the job is done for you. There are set questions that gets repeated in this subject and thus all the candidate need to do is to chalk out a way to prepare for the paper well before the actual exam strikes.